Carey Mulligan, Peter Sarsgaard. 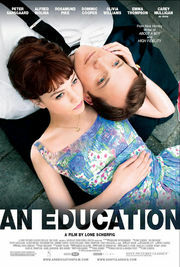 A 16-year-old girl takes up with an older man, and starts to reconsider her plans to attend Oxford. She says: A simple enough story, but a great, funny script by Nick Hornby along with strong acting by all made it very engaging. You do kind of want to tell this young girl to run screaming from this older (though charming) guy who is tempting her away from university, but the character is very intelligent, and her arguments about how much an education will benefit her at time (early 1960s) when career prospects for women are very few can’t that easily be dismissed. He says: This movie just made me way too uncomfortable. The whole premise was wrong. I could barely watch it. Categories: Movie reviews | Tags: drama, movies | Permalink.